Earned his Law Degree from Marquette University in 1991. Attorney Nicolet worked at Madgrigrano, Gagliardi, Zievers & Aiello during Law School and then worked for Westlaw the premier provider of legal research materials for law firms. 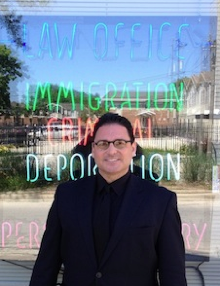 After 13 years in the legal publishing industry he joined forces with Attorney Ronald Shapiro‎ of Chicago, Illinois with offices in Northbrook, IL an employment expert in relation to all aspects of visas for employment and the family. Attorney Jason Sager is also a trusted of counsel on Devon Avenue. He is an expert in immigration defense against deportation. Mr. Nicolet believed that in starting his own practice, he could be more effective in helping people deal with a variety of legal issues. Hence, support not only for Immigration but for a person's life. Mr. Nicolet is active in a number of professional organizations including the American Bar Association, the Wisconsin Bar Association, the Milwaukee Bar Association, a member of the Phi Kappa Sigma Fraternity. Attorney Nicolet has also been admitted to practice in the Oneida Tribal Judicial System. Attorney Nicolet's goal is to service every client with professionalism, respect and integrity.